[139 Pages Report] The aircraft wire and cable market was valued at USD 658.9 Million in 2016 and is projected to reach USD 926.4 Million by 2022, at a CAGR of 5.91% during the forecast period. The objective of this study is to analyze, define, describe, and forecast the aircraft wire and cable market based on type, application, aircraft type, fit, and region. The report also focuses on the competitive landscape of this market by profiling companies based on their financial positions, product portfolios, growth strategies, and analyzing their core competencies and market shares to anticipate the degree of competition prevailing in the market. 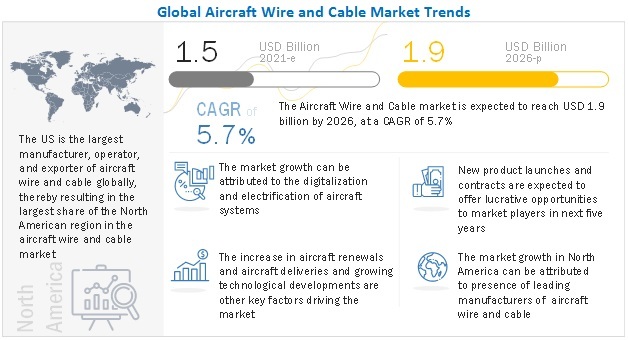 This report also tracks and analyzes competitive developments, such as new product launches, contracts, and joint ventures, and research & development (R&D) activities in the aircraft wire and cable market. The base year considered for this study is 2016 and the forecast period is from 2017 to 2022. The aircraft wire and cable market has been segmented on the basis of type, application, fit, aircraft type, and region. TE Connectivity (Switzerland), Amphenol Corporation (US), Rockwell Collins (US), Ametek (US), Radiall (France), Carlisle Companies (US), Pic Wire & Cable (US), W.L. Gore & Associates (US), A.E. Petsche Co. (US), and Leviton (US) are some of the main manufacturers in this market. Contracts, new product launches, and joint ventures are the major strategies adopted by key players in the aircraft wire and cable market. The aircraft wire and cable market is projected to grow from USD 695.2 Million in 2017 to USD 926.4 Million by 2022, at a CAGR of 5.91% from 2017 to 2022. 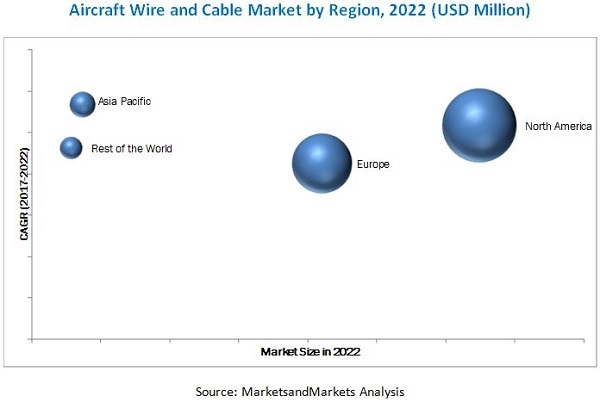 Increased number of orders for new aircraft across the globe and modernization of the existing aircraft are the key factors that are expected to drive the aircraft wire and cable market during the forecast period. The market has been segmented based on type, application, fit, aircraft type, and region. Based on type, the aircraft wire and cable market has been segmented into aircraft wire, aircraft harness, and aircraft cable. The aircraft wire segment is projected to grow at the highest CAGR during the forecast period. The growth of the aircraft wire segment can be attributed to the increase in demand for fly-by-wire and more electric aircraft wherein conventional actuators, hydraulic, and pneumatic systems are changed to electromechanical systems. Based on application, the aircraft wire and cable market has been segmented into flight control system, lighting, data transfer, power transfer, avionics, and others. The lighting segment is expected to grow due to the increasing demand for new aircraft. Hence, the increase in commercial air travel globally and the rising defense budgets of prominent economies are expected to drive the demand for aircraft wires and cables. Based on fit, the aircraft wire and cable market has been segmented into linefit and retrofit. The linefit segment is projected to grow at a higher CAGR as compared to the retrofit segment during the forecast period. The projected higher growth rate of the linefit segment can be attributed to the increase in aircraft orders as well as deliveries, economic growth across regions, and an increase in air passenger traffic. Based on aircraft type, the aircraft wire and cable market has been segmented into civil aircraft (general aviation, commercial passenger & cargo aircraft, and civil helicopters) and military aircraft (military helicopters, fighter jets, and transport carriers). The civil aircraft segment has been witnessing significant growth due to the increasing air traffic and rise in the disposable income of the middle-class population across the globe. The increased demand for new aircraft is also fueling the growth of the civil aircraft segment. North America is estimated to lead the aircraft wire and cable market in 2017, owing to the presence of major aircraft manufacturers, such as Boeing (US) and Bombardier (Canada). These companies have significant new aircraft orders, which are expected to drive the aircraft wire and cable market. The Asia Pacific aircraft wire and cable market is projected to grow at the highest CAGR during the forecast period, owing to new emerging aircraft manufacturers in Russia, China, Japan, and India. The existing backlogs of aircraft deliveries can restrain the growth of the aircraft wire and cable market. A delay in aircraft deliveries can also result in the cancellation of aircraft orders. For example, in 2015, Qatar Airways canceled the A320neo aircraft order due to a delay in aircraft delivery. Thus, existing backlogs in aircraft deliveries act as a restraint for the growth of the aircraft wire and cable market. Products offered by various companies operating in the aircraft wire and cable market have been listed in the report. The recent developments section of the report includes information on strategies adopted by various companies. TE Connectivity (Switzerland), Rockwell Collins (US), Carlisle Companies (US), Pic Wire & Cable (US), etc., are some of the major market players that have an extensive geographical reach and distribution channels.